Ever felt your toes tingle, or your calf cramp up when you’re halfway to the top of a mountain peak? Poor blood flow to these areas of the body could be contributing to muscle cramps or a numbness feeling in your toes or fingers. Improved blood flow, or circulation of blood, oxygen, and nutrients throughout the body benefits your hard-working muscles by reducing inflammation. We naturally have short-term inflammation in our bodies from exercising. 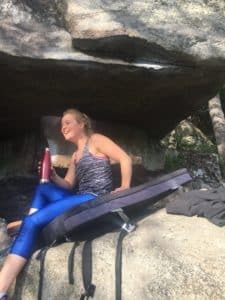 Reducing inflammation, especially on strenuous backcountry hikes or multi-pitch climbs can help your muscles recover faster to take on your next strenuous day. Not only does better circulation benefit your muscles, but it also strengthens your heart and lungs. Ever get to a new destination and your breath is what’s preventing you from going faster? Improved blood flow can help when altitude changes are significant. Before your planned trip in the backcountry, focus on eating a diet rich in fresh fruits and vegetables, healthy fats and a variety of herbs and spices to improve blood flow. Now let’s translate this dietary lifestyle into feasible backcountry meals. Citrus fruits- fresh clementines and oranges if it’s feasible to bring with or try squeezing lemon/lime to your water at the start of your adventure. Leafy greens and beets are rich in nitrates (NO3-), which convert to nitrites (NO2-) and then nitric oxide (NO) in your body. Nitric oxide increases vasodilation, which is the increase in diameter of blood vessels that allows for better blood flow to your muscles. Nitrates are naturally occurring in vegetables. Nitrites are found as additives to meats. Nitrites are concerning in this aspect when instead of converting to beneficial Nitric oxide, they convert to carcinogenic compounds called nitrosamines. Nitrosamines form when nitrites in meat are exposed to high heat. 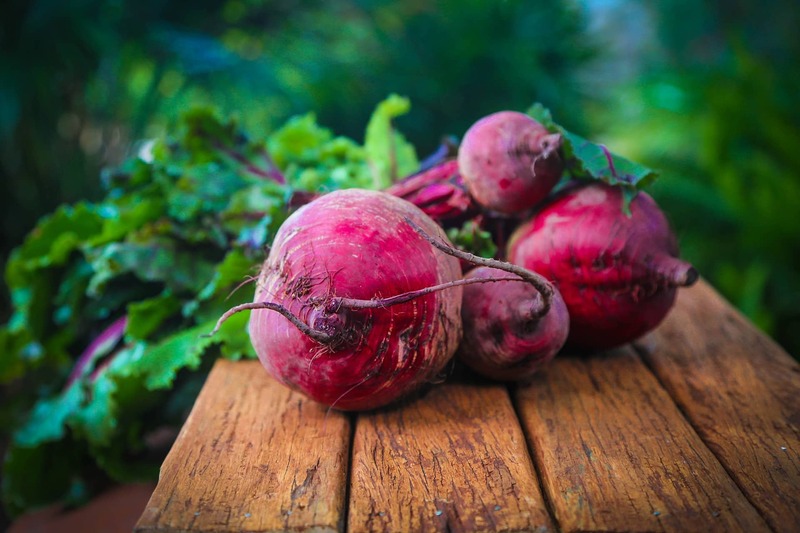 In various studies with athletes drinking concentrated beet juice to improve circulation, athletic performance for both resistance training and endurance training were improved. The combination of hiking and carrying a heavy pack when backpacking through the mountains causes your muscles to fatigue quicker. Nitrate foods such as beet juice have also been shown to improve exercise tolerance at high altitude by moving more oxygen to your tissues. So when you’re nearing that peak at 10,000 feet in altitude, concentrated beet juice such as BeetElite or bringing a beet powder like Humann Super Beets added to your water would be a great choice to begin your strenuous adventure. Healthy fats are rich in omega-3 fatty acids such as nuts, seeds, avocados, olives and fish. Try to eat fish at least two times per week or supplement with a fish-oil pill if necessary for the pre-adventure everyday lifestyle. When going out in the wilderness, try to pick salmon, tuna, or haddock dry-food packs. Look for meals that include flaxseed or chia seed in them. Combine cashews, peanuts, sunflower seeds, and pistachios with sesame sticks to make a delicious trail mix. Choose walnuts, almonds, and pumpkin seeds in dry-food meals for the longer wilderness trekking days. Herbs and spices contain numerous antioxidants, minerals and vitamins. Cocoa: Try 72 % cocoa dark chocolate chunks in your trail mix (if you’ll be hiking in lower outside temperatures). Turmeric with black pepper: Grab an Indian style dry-foods meal with curry because turmeric and usually black pepper are ingredients in in it to reduce inflammation and increase healthy blood flow to your entire body. Ginger or Garlic: Try dry-foods seasoned with ginger for a fresh taste, or garlic seasoned dry foods for a savory taste. Cinnamon: Next time you bring peanut butter with you on a trip, sprinkle cinnamon on top to add some more flavor and anti-inflammatory properties. Another option for spices in the backcountry would be to bring your favorite spices in a lightweight baggy in smaller portions to dash on top of your planned meals. Keep exercising and eating foods that fuel your daily adventures and prepare you for your longer outings in the backcountry! Seek out a sports dietitian to help guide your individual nutrition needs and fitness goals. 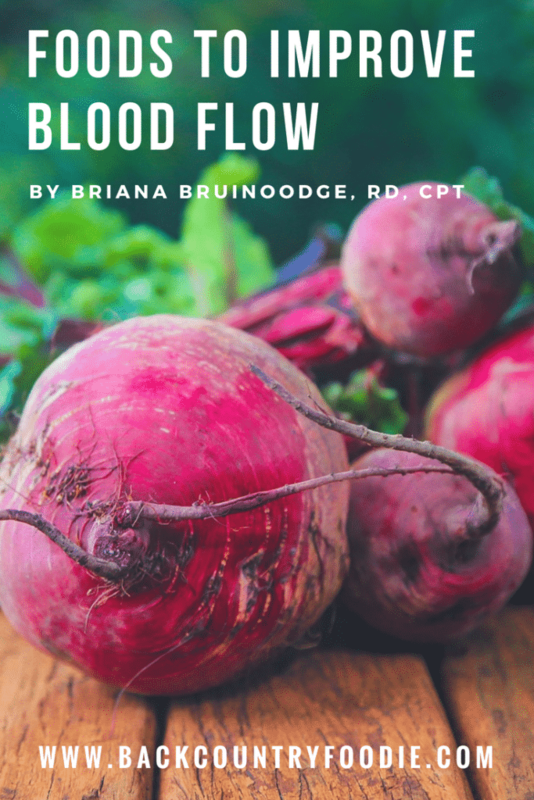 Briana Bruinooge, RD, CPT works for Nutrition in Motion, LLC in New Hampshire where she counsels athletes to meet their unique nutritional needs and fitness goals. Whether it be training for a 50K trail run, sport climbing, alpine skiing, baseball, tennis, weight lifting, etc. Briana will help guide you to fuel your passion. Taking her experiences working for the Minnesota Twins Baseball Organization and her personal trainer, group fitness, and TRX instructor certifications she is excited to discuss individualized nutrition and fitness goals with you! You can follow Briana on Instagram @bruinooski. Mosher, SL, Sparks, SA, Williams, EL, Bentley, DJ, and Mc Naughton, LR. Ingestion of a nitric oxide enhancing supplement improves resistance exercise performance. J Strength Cond Res 30 (12): 3520–3524, 2016. Tom Clifford 1 , Bram Berntzen 2 , Gareth W. Davison 3 , Daniel J. West 4 , Glyn Howatson 1,5, and Emma J. Stevenson 4. Effects of Beetroot Juice on Recovery of Muscle Function and Performance between Bouts of Repeated Sprint Exercise. Nutrients 2016, 8, 506. Whitfield, J., D. Gamu, G. J. F. Heigenhauser, L. J. C. Van Loon, L. L. Spriet, A. R. Tupling, and G. P. Holloway. Beetroot Juice Increases Human Muscle Force without Changing Ca2+-Handling Proteins. Med. Sci. Sports Exerc., Vol. 49, No. 10, pp. 2016–2024, 2017.